The nervous system is the control center for many of our daily activities. While we are the boss of many parts of the body, such as our legs, we have autopilots for essential functions such as digestion and blood circulation. Thank goodness we do not have to think every time we need the heart to beat! These autopilots are known as the autonomic nervous system, which include sympathetic and parasympathetic nerves. It is well established that sympathetic and parasympathetic neurons regulate stress response behavior, such as the fight or flight behavior. However, in a new exciting Science report, Magnon and others show that these peripheral nerves are also critical for the initiation and development of prostate cancer! Cancer does not need a fancy introduction. Everyone is related to cancer in one way or another. Despite its widespread and notoriety, cancer is a devastating disease that claimed 7.6 million deaths worldwide in 2008 ((Cancer [Fact sheet]. (2013, January). Retrieved from World Health Organization website: http://www.who.int/en/ )). In the US alone, the American Cancer Society predicts that there will be about 2 million cases of cancer resulting in 580,350 deaths in 2013 ((Siegel, R., Naishadam, D., & Jamal, A. (2013). Cancer Statistics, 2013. CA: A Cancer Journal for Clinicians. )). Because of the number of lives that cancer impacts, a large portion in scientific research is dedicated to understanding cancer and developing better treatments. From decades of research, scientists have proposed six characteristics common to all types of cancer ((Hanahan, D., & Weinberg, R. (2011). Hallmarks of Cancer: The Next Generation. Cell. )). These hallmarks provide the foundation for understanding the complex mechanism behind cancer development. Of all these attributes, angiogenesis (the growth of blood vessels) is one of the newer discoveries that has been receiving more attention lately. During the beginning stages, a normal cell will become cancerous due to mutations in genes that control division and growth. These mutations may arise from environmental causes or from normal ageing. The single mutated cell will grow and divide, giving rise to additional abnormal cells. However, these cells cannot survive alone: they require an adequate supply of oxygen and nutrients derived from blood vessels in order to keep proliferating ((Nishida, N., Yano, H., Nishida, T., Kamura, T., & Kojiro, M. (2006). Angiogenesis in Cancer. Journal of Vascular Health and Risk Management. )). Previous studies show that during a phase of rapid development, tumor cells will release signals that recruit new blood vessels to grow in the area, providing them with the necessary life support ((Folkman. (1971). Tumor Angiogenesis: Therapeutic Implications. The New England Journal of Medicine. )). Eventually, the tumor cells will penetrate the blood vessel and travel to distant sites throughout the body in a process known as metastasis. Figure 1: The hallmarks of cancer. First, cancer requires growth factors that are derived from within the cell or from the microenvironment. As the cell is equipped with growth suppressors that prevent normal cells from excessive growth, cancer cells can bypass these innate mechanisms to avoid apoptosis and retain unlimited replicative capacity. Like normal cells, tumor cells require life support in order to continue proliferation. Thus, cancer cells will induce angiogenesis to provide them with the necessary nutrients. Eventually, the cancer cell will penetrate capillary beds and attack distant sites in the body via blood circulation. Figure adapted from Hanahan and Weinberg, 2011. The importance of vascular support in cancer development suggests that scientists can starve cancer to death by preventing angiogenesis at sites of tumor cells. Indeed, tomatoes have been found to contain anti-angiogenic compounds that serve as important drug targets to combat cancer ((Cavallini, C., Trettene, M., Degan, M., Delva, P., Molesini, B., Minuz, P., & Pandolfini, T. (2011). Anti-angiogenic effects of two cystine-knot miniproteins from tomato fruit. British Journal of Pharmacology. )). Moreover, the development of cancer does not depend on only a cell-autonomous mechanism: a permissive extracellular environment is critical for tumor development and metastasis. Instead of solely targeting the cancer cell, scientists may instead be able to target the microenvironment occupied by tumor. Figure 2. Angiogenesis in cancer. Generation of new blood vessels provides tumor cells with adequate nutrients to continue proliferation. When the tumor grows large enough, it can penetrate the capillary bed and enter the blood stream for metastasis Figure adapted from Siemann 2002. For men, especially those who live in western countries, prostate cancer is the most common diagnosed form of cancer. In particular, one in six American males will develop prostate cancer during their lifetime ((Siegel, R., Naishadam, D., & Jamal, A. (2013). Cancer Statistics, 2013. CA: A Cancer Journal for Clinicians. )). Like all other forms of cancer, prostate cancer is incurable and life threatening once it has metastasized. Thus, understanding how prostate cancer develops and disseminates throughout the body will be key to preventing metastasis to other organs. The role of neurogenesis in cancer is an underexplored area of cancer research. In 1999, it was shown that pancreatic cancer tissues overexpressed nerve growth factor (NGF), coupled with an increase of its high-affinity receptor TrkA on the protective layer of pancreatic nerves ((Zhu, Z., Friess, H., diMola, F., Zimmermann, A., Graber, H., Korc, M., & Buchler, M. (1999). Nerve Growth Factor Expression Correlates With Perineural Invasion and Pain in Human Pancreatic Cancer. Journal of Clinical Oncology. )). NGF is a neurotrophic factor that is required by neurons for normal maintenance and survival. Without neurotrophic factors, a neuron will undergo apoptosis. However, NGF can trigger neurite sprouting via modulation of microtubule assembly, suggesting that nerves will grow as a response to signals from cancer cells ((Grubin, D., Feinstein, S., Shooter, E., & Kirschner, M. (1985). Nerve Growth Factor-induced Neurite Outgrowth in PC12 Cells Involves the Coordinate Induction of Microtubule Assembly and Assembly-promoting Factors. Journal of Cellular Biology)). Strikingly, inhibition of NGF increased apoptosis of breast cancer cells and inhibited tumor growth and metastasis, strengthening the idea of using neurons as cancer drug targets ((Adiraenssens, E., Vanhecke, E., Saule, P., Mougel, A., Page, A., Romon, R., & Nurcombe, V. (2007). Nerve Growth Factor Is a Potential Therapeutic Target in Breast Cancer. Cancer Research. )). Despite the therapeutic potential of targeting neurons, it still remains unclear how neurite outgrowth contributes to prostate cancer development. Perineural invasion, or the wrapping of cancer cells around nerves, is reported in 85% of prostate cancer patients and correlates with poor prognosis ((Ayala, G., Dai, H., Ittmann, M., Li, R., Powell, M., & Frolov, A. (2004). Growth and Survival Mechanisms Associated with Perineural Invasion in Prostate Cancer. Cancer Research. )). Surrounding the prostate gland is a connective tissue called stroma that contains fibroblasts, endothelial cells, nerves, and smooth muscle cells (Isaacs, 2013). The fluid secretions are made by a bundle of cells inside the stroma called the acinus, which rests under a layer of secretory epithelial cells. Between the stromal and epithelial layer are basal cells. The prostate gland receives autonomic innervation from parasympathetic (cholinergic, or acetylcholine-releasing) and sympathetic (adrenergic, adrenaline or noadrenaline-releasing) nerves ((Dixon, J., Chow, P., & Gosling, J. (1999). Anatomy and function of the prostate gland. In J. Nickel (Ed. ), Textbook of Prostatitis. Taylor and Francis. )). Both cholinergic and adrenergic nerves innervate the stroma and release factors which play important functions. Cholinergic nerves release acetylcholine that binds to muscaranin receptors on epithelial cells, triggering secretions ((Isaacs. (2013). Prostate Cancer Takes Nerve. Science. )). Adrenergic nerves release noradrenaline that bind to ?-adrenergic receptors on stromal muscle cells, causing them to contract and expel the secretions into the uretha ((Isaacs. (2013). Prostate Cancer Takes Nerve. Science. )). Figure 3: The role of autonomic nerves in cancer. Adrenergic nerves initiate early tumor growth via activation of Adrb2 and Adrb3, while cholinergic nerves induce tumor invasion, migration, and metastasis through activation of Chrm1. Image taken from Isaacs, 2013. To study the role of peripheral nerves in prostate cancer, Magnon and others ablated adrenergic nerves in mice transplanted with human prostate cancer cells, as well as in mice genetically engineered to develop prostate cancer. In both lines, tumor growth was inhibited by destruction of the adrenergic nerves. Previous studies showed that activation of B2-adrenergic receptors (AdrB2) from chronic stress led to increased cancer growth ((Thaker, P., Han, L., Kamat, A., Arevalo, J., Takahashi, R., & Lu, C. (2006). Chronic stress promotes tumor growth and angiogenesis in a mouse model of ovarian carcinoma. Nature Medicine.)). By genetically deleting AdrB2 and AdrB3 from tumor-bearing mice, cancer development in the prostate was severely compromised. These data indicate that adrenergic nerves initiate early tumor development by releasing noradrenaline that activates AdrB2 and AdrB3. Corroborating these findings, a study by Norwegian scientists documented that prostate cancer patients who took drugs blocking adrenergic B-receptors had a higher survival rate ((Grytli, Fagerland, Fossa, & Tasken. (2013). Association Between Use of B-Blockers and Prostate Cancer–Specific Survival: A Cohort Study of 3561 Prostate Cancer Patients with High-Risk or Metastatic Disease. European Urology. )). Next, to investigate the role of cholinergic nerves, the researchers depleted the prostate cancer mice of Chrm1 (stromal type 1 muscarinic receptor) by pharmacological and genetic means. Remarkably, tumor metastasis and invasion were blocked in the absence of Chrm1. When the tumor-bearing mice were treated with carbochol, a drug that increased the affinity of Chrm1 to acetylcholine, the tumor became more invasive, indicating that Chrm1 plays a role in the dissemination of prostate tumor to lymph nodes and other distant sites. These data suggest that cholinergic nerves release acetylcholine to activate Chrm1, promoting proliferation and migration of prostate cancer. Analysis of tissues isolated from 43 patients with prostate cancer revealed increase fiber densities within tumor areas. More importantly, higher nerve densities were associated with poor clinical outcome ((Magnon, C., Hall, S., Lin, J., Xue, X., Gerber, L., Freedland, S., & Frenette, P. (2013). Autonomic Nerve Development Contributes to Prostate Cancer Progression. Science. )). This discovery of the novel role of neurogenesis in the development cancer is exciting, opening up a whole new door of therapeutic possibilities. Scientists now have a novel drug target, which is to inhibit neural activation of prostate cancer. In addition, we have now gained better understanding for how prostate cancer develops. Peripheral nerves innervating the prostate gland are critical for both initiation and later migration of cancer. While sympathetic nerves initiate the survival of early prostate cancer, parasympathetic nerves increase proliferation and metastasis of the tumor. However, a question remains: is cancer development a tumor-autonomous phenomenon, or is it dependent on neurons? The increased density of nerve bundles documented by this study could be explained by an increase in expression of NGF, as seen in breast cancer. It would be worthy to check for expression of NGF in prostate cancer to see whether neurite outgrowth was truly the result of overexpressed neurotropic factors. If prostate cancer cells autonomously express NGF, then neurite bundle increase is indeed a response to signals secreted by tumor. Besides being a neurotrophin, NGF has also been suggested to be angiogenic factor ((Nico, Mangieri, Benagiano, Crivellato, & Ribatti. (2008). Nerve growth factor as an angiogenic factor. Microvascular Research. )). Perhaps, NGF induces vascular growth in an indirect pathway via neurons: as the neuron grows and extends as a response to NGF, it releases signals that promote angiogenesis. Figure 4: Hypothesis of cancer development. 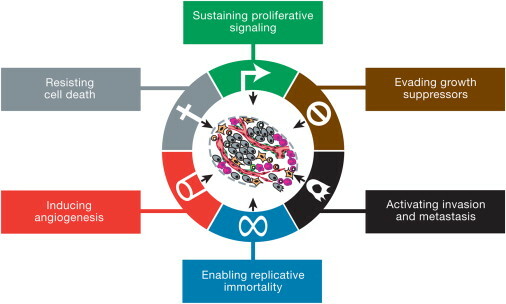 First, genes regulating cell cycle and growth are mutated, turning a normal cell into a cancerous cell. Then, the cancerous cell overexpresses NGF that induces sympathetic nerve outgrowth. Sympathetic nerves release noradrenaline (NE) that activate Adrb2, resulting in overexpression of tumor-derived VEGF that promotes angiogenesis. The blood vessels provide life support for the tumor cell, leading to increased proliferation. Eventually, the tumor cells penetrate the blood vessels and metastasize to other parts of the body. Figure made by Duy Phan, 2013. Indeed, in a mouse model of ovarian cancer, behavioral stress triggers the release of neurotransmitters that activate the AdrB2 on ovarian tumor cells ((Thaker, P., Han, L., Kamat, A., Arevalo, J., Takahashi, R., & Lu, C. (2006). Chronic stress promotes tumor growth and angiogenesis in a mouse model of ovarian carcinoma. Nature Medicine.)). AdrB2 is a G-protein coupled receptor that activates a cell cyclic AMP-protein kinase A signaling pathway, leading to overexpression of vascular endothelial growth factor (VEGF). Increased expression of VEGF resulted in angiogenesis and growth of cancer cells. Remarkably, VEGF levels appear to be higher in patients with metastatic prostate cancer ((Botelho, Pina, & Lunet. (2010). VEGF and prostate cancer: a systematic review. European Journal of Cancer Prevention. )). Prostate cancer may develop cell-autonomously, but then releases NGF to induce sympathetic nerve growth, activating adrenergic receptors and finally resulting in angiogenesis via overexpression of tumor-derived VEGF. If this hypothesis holds true, the future therapeutic strategies will be nerve-wrecking news to prostate cancer!